This was a recipe I came across a while ago in a Rachel Ray magazine and made the coffee rubbed steak but didn’t have any sweet potatoes on hand, so I knew I was going to be visiting it again! Little did I know I would be eating it two days in a row! In an effort to impress my wonderful girlfriend I thought this would be a tasty little meal for our stay at home date, but unfortunately I had a little flare up on the barbecue and the steaks were dry! WORST NIGHTMARE. Fortunately we are still together after that catastrophe and Carlene’s camera wasn’t at home so I didn’t even have to worry about pictures for the blog. So with another steak in the fridge, camera at home and renewed vigor to cook that baby right, I set out to make the perfect meal (unfortunately this time it was just for myself). So I share it with the world. 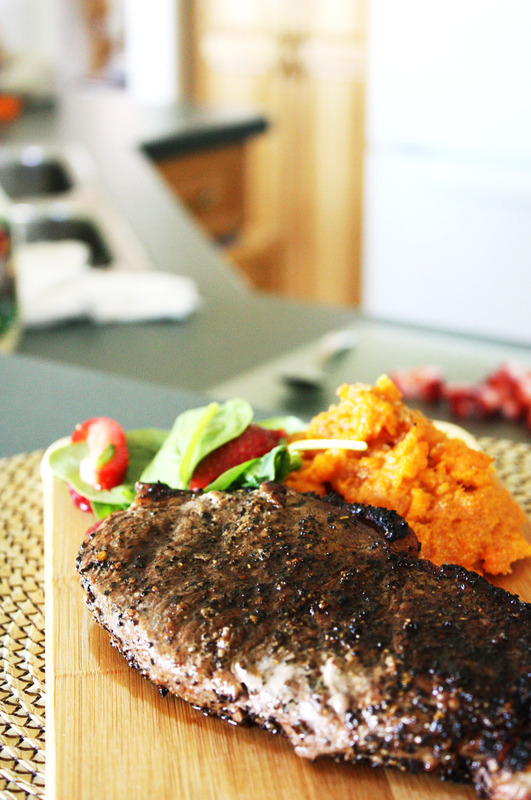 This recipe is fairly simple and the sweet potatoes were a nice little change up to my regular steak and potatoes. I just combined this into a bowl, brushed my steak with olive oil and rubbed the spice in, let the steak sit for about ten minutes and bbq’d on high for 5 minutes on each side. To cook the sweet potatoes, just cut them into chunks, boil for 15-20 minutes and then puree them with a blender or food processor and add the other ingredients. I also added a spinach and strawberry salad with creamy poppy seed dressing for some green in the meal! Now I am not a huge sweet potato fan, but after making this steak months ago, I knew they would go perfectly with the meal. With the dark roast coffee and the steak spice, the steak is bitter and salty (in the best way possible), so the sweet potatoes complimented this better than a regular potato would have and the spinach salad also added another area of sweetness to compliment the steak. The second time around the meal was excellent, unfortunately all the red wine was drank the previous night so I didn’t get to enjoy a glass with my steak, but it was still a wonderful meal! Check out my Hazelnut Coffee Steak Rub recipe, it made one of the Top 10 Finalists in the 2011 Beringer Great Steak Challenge. The Sweet-Heat rub paired with a nice chilled glass of Chardonay is out of this world. Looks yummy! Love the combination of coffee and meat and I’m a huge fan of mashed sweet potatoes…this is a must try! Looks delicious!! Put this on taste spotting!! I had some of the spinach salad and it was great!